What a terrible loss. I hope they can rebuild. 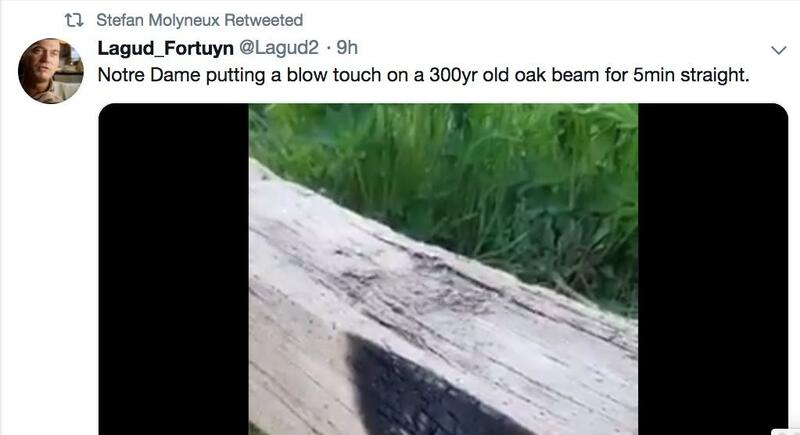 There's a video in the link. That's good to hear. It is a lot of stone. That's got to make things easier. But still it's going to be a good long while before anyone is going to be able to visit the inside. The have been some events that have left left me very saddened. Most have led to loss of life in tragic circumstances and a few have been purely material. Any destruction of irreplaceable ancient buildings and other construction is bad enough but the wrecking of the Babylon treasures in Iraq by ISIS and this seem to be especially poignant. Notre Dame seems to affect me more than any other simply because it's the only major one that I've seen before the destruction. Macron did. He is satanist. His secret services can do it as how killed his own people in the name of ISIS did. I have seen it in person as well, absolutely gorgeous. It's crazy to think that it was already ancient by human standards when my country was just formed. The destruction by ISIS was way worse to my sensibilities. Fires happen. But these people who intentionally destroy knowledge, there's something deeply wrong with that. The loss is comparable with the burning of all the Maya books by the Spaniards. Many things can be rebuilt but that sort of thing can never be recovered. I saw it in person years ago on my first trip abroad. It has been announced they're going to spend 100 million euros to rebuild it. It's gonna take a long time probably. I saw it in person years ago on my first trip abroad. Likewise and somehow that gives it more impact than other damaged sites. It has been announced they're going to spend 100 million euros to rebuild it. It's gonna take a long time probably. And it might even "look the same" but somehow it "won't be the same". Not as bad as I feared. It looks like some of the interior wasn't a total loss. wooden building elements on the upper floors burned. the lower floors and the general building remained intact because the stone did not burn. Firestarter Macron failed. 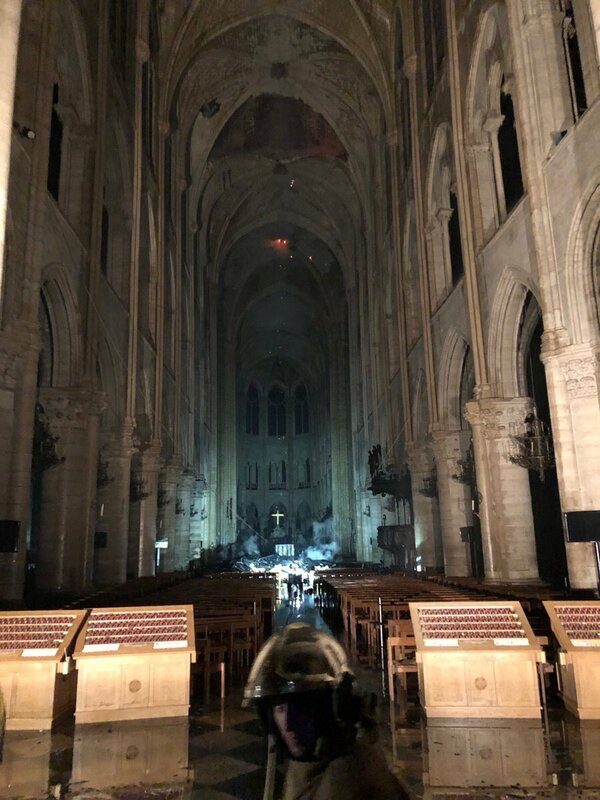 Fire department of Paris has released video footage of its epic man on duty at the Notre Dame fire. 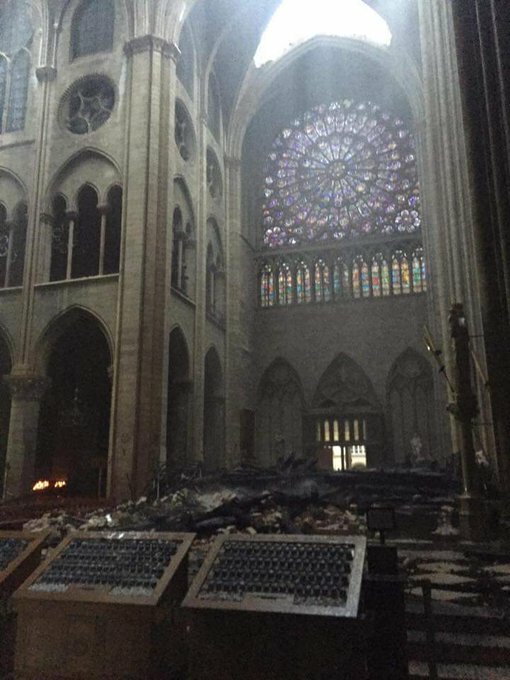 1 of the three rose windows has fallen down. 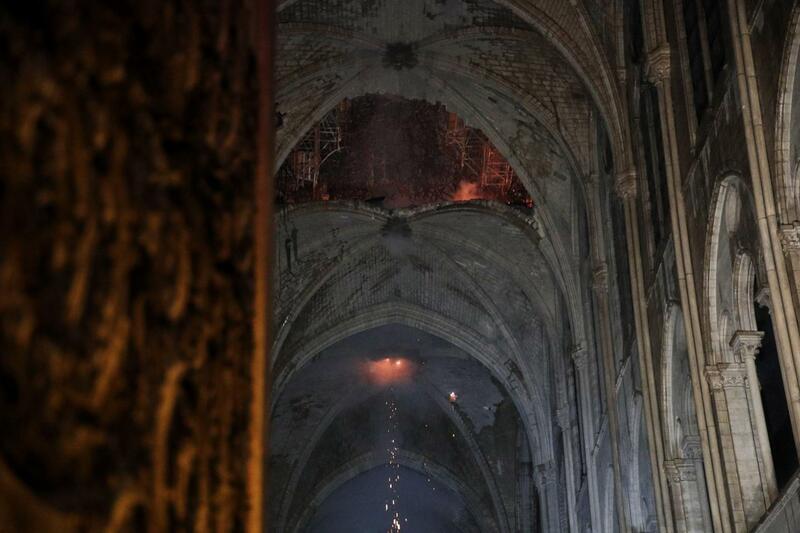 The two remaining rose windows appear unharmed. Some of the minor glass windows have been destroyed, but the oldest and largest ones appear intact. The amount of water damage to the many paintings within the church is still unknown. It is uncertain how far the fire and water has damaged the interior structure. Seriously though, there's been a much worse tragedy now in Sri Lanka. I don't really know what to say about it. I heard it was caused from an electrical shortage.